Gracie Greiner is a senior at Washington High School. She is the daughter of Shaun and Heather Greiner of Washington. 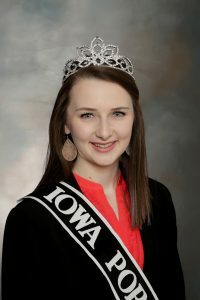 She plans to attend Iowa State University in the fall and major in animal science. Her hopes are to build on that experience and to become a large animal veterinarian serving southeast Iowa. Gracie is looking forward to promoting pork. Isaac Wiley is a senior at Vinton-Shellsburg High School. He is the son of Todd and Denise Wiley of Walker. 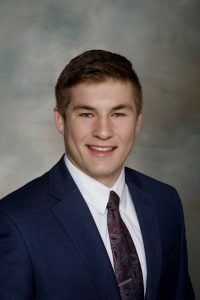 He plans to study agricultural business at Iowa State University in the fall. He plans to use that education to build a career in the pork industry. Isaac is looking forward to advocating for the pork industry. 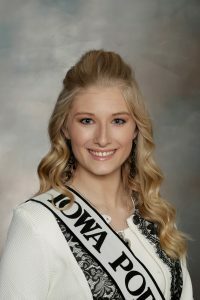 Carli Grau is a student at Des Moines Area Community College and will study agriculture and life science education at Iowa State University in the fall. She is the daughter of Shannon Grau-Quail and the late Gordon Grau of Newell. Her career goal is to teach high school ag education. Carli sees the need to educate consumers about not only pig production, but all forms of agriculture.